Nature 2015 520(7547), 368-72. Vemurafenib (PLX4032, RG7204) purchased from Selleck. FRA1 downregulation during RAFi treatment drives the reactive secretome. c, Relative mRNA levels of FRA1 during vemurafenib exposure [0.1-1 uM]. d, Representative immunofluorescence staining of A375/A375R tumours for GFP (A375R, green) and FRA1 (red) after vehicle or vemurafenib treatment (5 days). DAPI, 49,6-diamidino-2-phenylindole. Scale bars, 50 um. Acquired EGFR expression in BRAF(V600E) mutant melanoma after vemurafenib resistance. Immunohistochemical (IHC) analysis (ultraView DAB stain, brown) showing increased EGFR expression in formalin-fixed paraffin embedded (FFPE) (Patient number 1-5) and frozen (Patient number 6) melanoma tissue sections from BRAF(V600E) mutant melanoma patients who developed resistance to vemurafenib, dabrafenib or trametinib as indicated. For each patient, the first biopsy is from the pre-treatment tumour; the second biopsy was performed after the tumour had progressed under treatment. For patient number 4, the first biopsy was performed when the patient was in partial response, but rapidly developed secondary resistance. Then 4.5 months later, the second biopsy was taken. Nature 2014 508(7494), 118-22. Vemurafenib (PLX4032, RG7204) purchased from Selleck. Long-term colony formation assay of thyroid cancer (8505C), CRC (OXCO-1, COLO741 and WiDr) and melanoma (A375) cells. Cells were grown in the absence or presence of PLX4032 at the indicated concentrations for 10-14 days. For each cell line, all dishes were fixed at the same time, stained and photographed. Nature 2012 483(7387):100-3. Vemurafenib (PLX4032, RG7204) purchased from Selleck. Resistance to BRAF(V600E) inhibition in WiDr cells is mediated through feedback activation of EGFR. Biochemical responses of WiDr cells treated with PLX4032, cetuximab or gefitinib, or their combinations, were documented by western blot analysis. Cells were harvested at 6 h after drug treatment. BRAF(V600E) inhibition results in strong upregulation of Tyr1068 p-EGFR and Ser473 phosphorylated-AKT (p-AKT), which is abrogated by EGFR inhibitors. Furthermore, combination treatments result in complete inhibition of phosphorylated MEK (p-MEK) and phosphorylated ERK (p-ERK). Heat shock protein 90 (HSP90) served as a control. Co-stain and sort for EGFR and NGFR into four populations: double-negative and double-positive, and EGFR-positive or NGFR-positive only, followed by 1 μM vemurafenib (2 weeks). Resistant colonies circled in the images (1 of n = 2 biological replicates). Nature, 2017, 546(7658):431-435. Vemurafenib (PLX4032, RG7204) purchased from Selleck. Box plot showing sgRNA frequencies after vemurafenib or control treatment from n = 4 infection replicates. Nature, 2017, 548(7667):343-346. Vemurafenib (PLX4032, RG7204) purchased from Selleck. Patient-derived melanoma lines induced into a therapy-resistant mesenchymal state with TGFβ treatment acquire resistance to BRAF inhibition and sensitivity to GPX4 inhibition. Nature, 2017, 547(7664):453-457. Vemurafenib (PLX4032, RG7204) purchased from Selleck. a-c, Inhibitors of BRAFV600E (PLX4032) and MEK1/2 (PD98059 or AZD6244) increase PGC1α and ID2 expression (a, b) and repress integrin expression and signalling (b, c). Cells were treated with indicated concentration of inhibitors for 6 h (a, b) or 24 h (c). d, e, PLX4032 increases the interaction between ID2 and TCF4 (d) and decreases the occupancy of TCF4 at the promoters of integrin genes (e). f–g, PGC1α and ID2 are partially required for PLX4032-mediated inhibition of invasion and metastasis. For in vitro assays (f), A375 cells were incubated with 1 μM PLX4032 for 10 h. Images represent one picture captured per membrane with the scale bar representing 200 μm. Values in a, b, e and f represent mean±s.d. of independent biological triplicates; *P<0.05 and **P<0.01 by Student's t-test in a, b, e, f.
Nature, 2016, 537(7620):422-426.. Vemurafenib (PLX4032, RG7204) purchased from Selleck. (A) Concentration-dependent target occupancy of vemurafenib and its cognate target BRAF compared with the off-target FECH. ITDR profiling was performed at 55°C with vemurafenib-treated K562 cells and showed concentration-dependent thermal stabilization of FECH and BRAF. The data are normalized so that the quantity of soluble target at the highest compound concentration, which reflects maximum thermal stabilization, is set to 1 and fixed for curve-fitting. (B) ITDR performed at 55°C with K562 cells treated with vemurafenib, alectinib, or crizotinib over a range of concentrations. Alectinib displays a more potent effect on FECH as compared with that by vemurafenib, whereas crizotinib, a drug not known to cause photosensitivity, has no effect. Science, 2014, 346(6205):1255784.. Vemurafenib (PLX4032, RG7204) purchased from Selleck. (C) FourBRAFi-resistant ex vivo clones (exv.A1, exv.A2, exv. A3, and exv. A4) were isolated from four different A375 tumors receiving continued PLX4720 treatment from the cohort shown in (B). The protein levels of phosphorylated PDGFRB, p-SHP2, SHP2, p-MEK, MEK, and HSP90 were measured by western blotting, and the A375 parental cell line was treated with 2 mM vemurafenib for 24 hr. HSP90 served as the loading control. Cell, 2018, 173(6):1413-1425. Vemurafenib (PLX4032, RG7204) purchased from Selleck. Impact of BRAF and SYK/MEK inhibition on ERK activation in primary CLL cells. Representative Western blot analysis for pERK and tERK of the protein lysate at the indicated concentrations of vemurafenib and dabrafenib for patients 1 and 2. The experiment was performed 2 times with similar results. J Clin Invest 2014 124(11), 5074-84. Vemurafenib (PLX4032, RG7204) purchased from Selleck. The B-Raf inhibitor PLX4032 decreases cell surface DR5 levels . BCPAP cells were treated with the indicated concentrations of PLX4032 for 12 h and then harvested for extraction of cellular total RNA and subsequent RT-PCR to detection of DR5. Oncogene 2015 10.1038/onc.2015.97. Vemurafenib (PLX4032, RG7204) purchased from Selleck. Stat3 is activated in melanoma cells with acquired resistance to vemurafenib. Sensitive and resistant A375 melanoma cells were stimulated by different doses of vemurafenib as indicated. Total protein was collected 6 hours after stimulation. Protein expressions of phospho–ERK1/2, Stat3, phospho-Stat3, and paired box homeotic gene 3 (PAX3) were analyzed by western blot along with tubulin, which served as a loading control. J Invest Dermatol 2013 133, 2041. Vemurafenib (PLX4032, RG7204) purchased from Selleck. Clonogenic assays of VM21 (b) and VM1 (c) cells treated with 1 μM PD166866 (PD) and 0.1 μM RG7204 (RG) for 14 days. For VM21 cells, the combination index (CI) value indicating synergism is shown. For VM1 cells, inefficacy of 1 μM PD166866 alone precluded calculation of a CI value and P-values for reduction of clonal growth are shown instead. a, P<0.05 versus RG; b, P<0.01 versus PD. J Invest Dermatol 2011 131, 2087-95. Vemurafenib (PLX4032, RG7204) purchased from Selleck. BRAF inhibition improves autologous tumor recognition by CD8+ tumor-infiltrating lymphocytes. (A and B) Tumor-infiltrating lymphocytes (TILs) were co-cultured with autologous BRAFV600E mutant melanoma target cell lines treated with vemurafenib (Vem) at low or high dose, or left untreated. (A) Frequency of tumor necrosis factor α (TNF α)-and interferon γ (IFN γ)-producing CD8+ TILs. (B) Frequency of CD8+ TILs producing TNF α and IFN γ and simultaneously mobilizing CD107a upon co-culture with autologous tumor cells. *p < 0.05; ** p < 0.01; ***p < 0.001. Oncoimmunology 2012 1, 1476-1483. Vemurafenib (PLX4032, RG7204) purchased from Selleck. Cells were treated with 1 μM vemurafenib for 24 h, and the ERK activity was evaluated by western blotting using phospho-ERK antibodies. Actin was used as a loading control. Cell Signal, 2018, 42:30-43. Vemurafenib (PLX4032, RG7204) purchased from Selleck. Fig 1 represents the cell cytotoxicity assay to study the effect of Vemurafenib on ABCC10 (MRP7) overexpressing cells. Table 1 shows the data suggesting reversal of resistance ABCC10 overexpressing cells with Vemurafenib at 20 μM using Paclitaxel as a substrate. HEK293 is a human embryonic kidney cell line while HEK293/MRP7 is an MRP7 overexpressing cell line generated by MRP7 gene transfection. Cepharanthine is a positive control. Vemurafenib (20 μM) in combination with Paclitaxel can reverse MDR mediated by MRP7 over-expressing cells as it decreased the resistance fold from 24-fold to 1-fold. Dr. Zhe-Sheng Chen of St. John's University. Vemurafenib (PLX4032, RG7204) purchased from Selleck. Fig 2 represents the cell cytotoxicity assay to study the effect of vemurafenib on ABCG2 (BCRP) overexpressing cells. Table 2 shows the data suggesting reversal of resistance ABCG2 overexpressing cells with vemurafenib at 20 μM using mitoxantrone as a substrate. 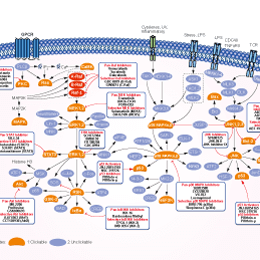 H460 is a hepatic carcinoma cell line while H460/MX20 is an ABCG2 overexpressing cell line made resistant by drug selection with mitoxantrone. FTC (Fumitremorgin C) is a positive control. Vemurafenib (20 μM) in combination with Mitoxantrone can reverse MDR mediated by ABCG2 over-expressing cells as it decreased the resistance fold from 133-fold to 93-fold. represents the effect of Vemurafenib on the accumulation of [3H]-Mitoxantrone. Vemurafenib increased the intra-cellular accumulation of Mitoxantrone in ABCG2 overexpressing H460/MX20 cells compared with parental H460 cells. From the figure, the accumulation in H460/MX20 control is decreased whereas in presence of Vemurafenib 20 μM, it is significantly increases the [3H]-Mitoxantrone accumulation. Anti-ErbB3 mAbs differently counteract the increase of ErbB3-dependent AKT phosphorylation and potentiate growth inhibition induced by vemurafenib. LOX IMVI melanoma cells serum starved and treated with vemurafenib (0.3μ M) for 24 h were incubated or not with 20 μ g/ml of anti-ErbB3 mAbs A4 (a),A3orA2(d). Western blot analysis shows that A4 and A3, but not A2 mAbs abrogate receptor phosphorylation and ATK signaling. For densitometric analysis pErbB3/ErbB3, pERK/ERK and pAKT/ATK values are expressed as fold change with respect to the control unstimulated cells to which value = 1 was assigned. Results are expressed as mean values from three independent experiments. LOX IMVI cells were grown in the presence of different doses of vemurafenib alone or in combination with 20 μg/ml of A4 (b),A3 or A2(e) mAbs for 10 days. Cells were then fixed and stained with crystal violet(c). Cells were then dissolved in a Methanol/SDS solution and the adsorbance (595 nm) was read using a microplate ELISA reader (b, e). Quantitative analysis for curve fitting and for IC50 evaluation, performed by KaleidaGraph software, shows that the treatment with A4 and A3 but not with A2 enhances the inhibitory effect of vemurafenib on cell growth (IC50 vem = 155 nM; IC50 vem + A4 = 36 nM; IC50 vem + A3 = 62, IC50 vem + A2 = 146 nM). Results are reported as mean values±standard deviation (SD) from three independent experiments. p-values were calculated using Student ’s t test and significance level has been defined as p < 0,05. For IC50 vem + A4 and IC50 vem + A3 p < 0,001 vs IC50 vem; IC50 vem + A2 NS vs IC50 vem. Vemurafenib (PLX4032, RG7204) purchased from Selleck. Bollag G, et al. Nature, 2010, 467(7315), 596-599. Yang H, et al. Cancer Res, 2010, 70(13), 5518-5527. Prahallad A, et al. Nature, 2012, 483(7387), 100-103. Kumar A, et al. J Mol Biol, 2005, 348(1), 183-193. Yang H, et al. Cancer Res, 2012, 72(3), 779-789. How about the half-life of Vemurafenib(S1267)? It was reported that the half-life of the compound is 57 hours. The vemurafenib power, when prepared in 4% DMSO/30% PEG 300/5% Tween 80/ddH2O solutions, form a pellet down the tube? When prepare this kind of vehicle, please dissolve the drug in DMSO clearly first. If it dissolves not readily, please sonicate and warm in the water bath at about 45 degree. Then add PEG and Tween. After they mixed homogeneously, then dilute with water. SB590885 : B-Raf-selective, Ki=0.16 nM. ZM 336372 : C-Raf-selective, IC50=70 nM. Sorafenib Tosylate : Approved by FDA for advanced renal cancer. 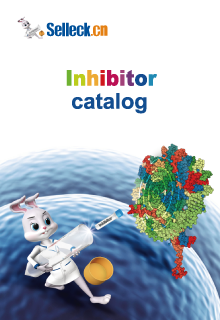 TAK-632 New : Potent pan-Raf inhibitor with IC50 of 8.3 nM and 1.4 nM for B-Raf(wt) and C-Raf, respectively, showing less or no inhibition against other tested kinases.